Since I don’t really eat meat, I know my blog lacks meat recipes, I figured that when I cook for some non-vegetarian people who do eat meat, I take the opportunity for putting up the recipe on the blog. I look at those chicken thighs and it reminds me of my cute and sweet parakeet and I really have to think about something else or I won’t be able to cook them. Sometimes, I have to detach myself from things that bother me, or I won’t be able to do anything. I love fresh herbs, all of them! When I first moved to California, I was amazed to see tons of houses with bushes of rosemary as a decoration plant. I thought that was funny, I was wondering if people used it for cooking or if it was just as a decoration…and still I have no answer to that. I used to live on a street where almost all houses had huge rosemary plants bordering them and coming all the way on the sidewalk. Sometimes, when I was out of rosemary, I would help myself. I know it’s not very appropriate but at the time, I thought it was not a big deal especially considering the size of the rosemary spreading in a public zone. 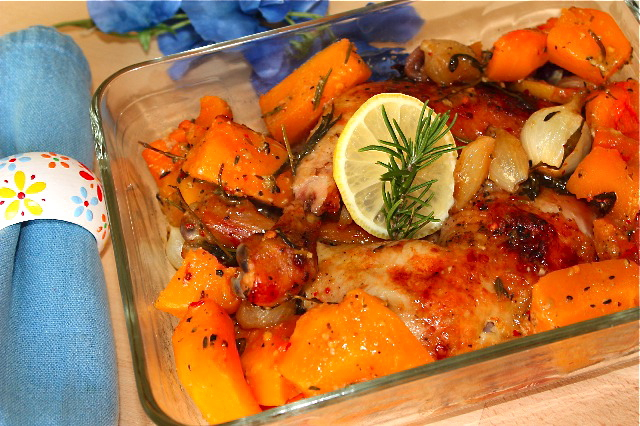 This chicken is very flavorful and mainly due to the tons of herbs I use in it. Sometimes I marinate it overnight so it gets infused with herbs and you get a wonderful roasted chicken. You can also use pearl onions instead of yellow onions. Squash being in season, I figured I would use it, but some other vegetables like potatoes, carrots, turnips, etc…would work as well. If you have guests over, and want to spend time with them rather in your kitchen, roasted chicken is the key, you just need to baste it once in a while and that’s it. It’s like the kid that doesn’t need any attention, you just give him a toy and he keeps himself busy. You might need to cover the dish with some aluminum foil for about 20-30 minutes, depending on how your oven cooks, then removing the foil to let the chicken brown. I am still trying to figure out how my oven works with the circular heat. You can marinated the chicken overnight with herbs, garlic, mustard and onion, but it’s optional. You can get a fragrant chicken even if you don’t marinate it. Keep some herb sprigs, chop some of it. Mix all ingredients together in a mixing container except chicken broth and mustard. Place chicken in a oven tray, add herb mixture on top of chicken and coat chicken with it. Spread mustard on both sides of legs. Cook in a pre-heated oven at 370F for about 30 min, then add broth and regularly baste chicken with it. Add squash, salt and pepper, and cook until chicken is well roasted and squash tender. This entry was posted by silvia on November 17, 2009 at 8:59 am, and is filed under Meat. Follow any responses to this post through RSS 2.0.You can leave a response or trackback from your own site. Beautiful. Roasted chicken is a real comfort food for us, and so thankfully easy to do when the oven does most of the work. I love one pot/casserole dish meals! wow,it is “merveilleux” this recipe and so goodlooking! I totally understand! I know I told you I had a pet bird as a girl and I certainly can’t eat things that remind me of pets!! That said, your dish looks beautiful as always. I love rosemary. I think it goes especially well with potatoes and chicken (but I don’t eat a lot of chicken). And yes, I do use the rosemary from my big rosemary bush! aww, your parakeet is lucky to have you. I wonder if someone planted the bush, moved out, and the new tenant doesn’t realize it’s an herb? i don’t think i’ve seen anything like that where i live, ha. lucky for you it’s bountiful! your chicken thighs look tasty with it! I love a good chicken thigh recipe. Thanks for posting! Favorited it on Foodbuzz. Oh my silvia, this is so beautiful! Should invite me to your new home huh! haha…. My kind of dish right now. All I have to do is bake it. I love rosemary too. They’re so fragrant and wonderful. Quick and delicious, I’m sold! What a beautiful, flavorful recipe. The olives sold me!